I pick up the empty Overwatch box and take it over to the counter. My legs are weak, I’m trembling and sweating. Not because I’m so excited about Overwatch. But I need a distraction in the most difficult time in my life. Just a couple of hours later, I was in bed crying, convinced I was going to die. I zoomed through my demise. I would lose the feeling in my legs at first. Then it would spread to my hands and arms. I would be a huge burden on my wife and family for a few months until the end. I cancelled plans. I wouldn’t make it through to that big trip next year. There was so much I would miss out on. Why me? I kept asking. That afternoon there was a clear spot and I was able to focus and install Overwatch. Of course, it needed to download an update first. I should have expected this as being normal but during this time it was a devastating blow. I saw the update would take 3 hours! A lifetime. Overwatch was supposed to be my distraction, but now I needed another distraction. So I started streaming something until I had the genius idea of restarting the download. If in doubt, start it again. And it worked! The download was now zooming along. I had my distraction for a few hours, until an appointment with my doctor and I knew where to start. The Overwatch hype and coverage of the last several weeks was unescapable. I knew plenty about the game already without even trying. I knew about the characters, the loot and the memes. After the tutorial, I went with the go-to heroes for new players: Bastion and Soldier 76. I knew playing as Bastion would feel cheap but it also felt immensely satisfying. I needed a “play of the game” and I got one. It felt great. Before I knew it, it was time to see the doctor. In the prior 2 weeks, I went from feeling some tingling in my feet to feeling I was going to die. It escalated quickly. During this time I had been to the hospital and also saw another doctor a few days later. I even had test results come back that showed I was okay. But I interpreted this as meaning I had something even worse. The tests couldn’t even pick it up. That was my thinking. I was involved in countless Google searches for countless conditions. I became so sensitive to my body. Every sensation was misinterpreted. I left the doctor’s practice that day with a realisation (helped along by the excellent doctor). The one thing I didn’t consider was that I was contributing to my symptoms. The tingling in my feet had spread to other parts of my body and were sharp electric-like pains. I would sweat and have panic attacks. All of this was caused by anxiety. The anxiety that something is wrong with me, is what is wrong with me. My very own Twilight Zone episode. I now knew the cause and I had some time off from work. The Overwatch distraction was just getting started. In my head, it was going to be like a job. I would play for a few hours in the morning (with a couple of tea breaks of course). I would eat lunch in the same seat (just like eating at my desk at work). Then carry on playing and finish up around 5pm. I wanted routine and calm. As I gained a deeper understanding of the game and saw what other characters were capable of, I started experimenting with the likes of Mei and Pharah. 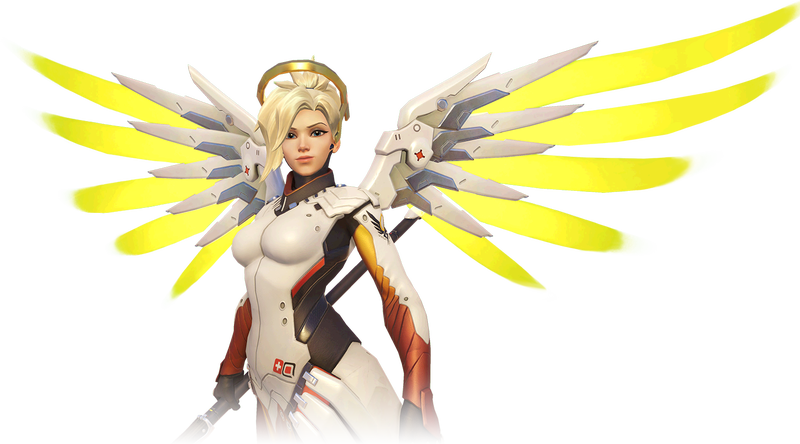 But it wasn’t until I started playing as Mercy that I really got into Overwatch. It is tempting to say that playing as a healer, healed me. There is something therapeutic about the beams from Mercy’s staff. The medication and support I had around me, is what is healing me. But the distraction certainly helped. I enjoy playing as Mercy. I enjoy helping others in such a direct way. I was looking after my team. I wanted routine during this time and routine can be boring. The diverse cast of characters is what keeps Overwatch interesting. I started to also play regularly as Torbjörn, Lucio and D.Va. I’ve yet to try competitive. A part of me doubts my ability but I just want to carry on having fun with it. Barely a month has passed since the day I bought Overwatch. It is still early days for the game and for my anxiety. I’m in a much better place, that’s for sure. But Overwatch is now tied to this experience and in particular to that day when I bought it. I will forever associate the two and that’s fine with me. I don’t think I need to separate them. There are albums, books, films and games I associate with times of the year. Or with certain events. Overwatch will be associated with the time I thought I was dying. What started out as a distraction has turned into genuine joy.